You’ll have to go here to read the CNN article about a 61 year old computer that has been restored. Please note the picture. While the technology of the computer has been eclipsed, what hasn’t changed is the way news photographers pose people for pictures. The W.I.T.C.H. 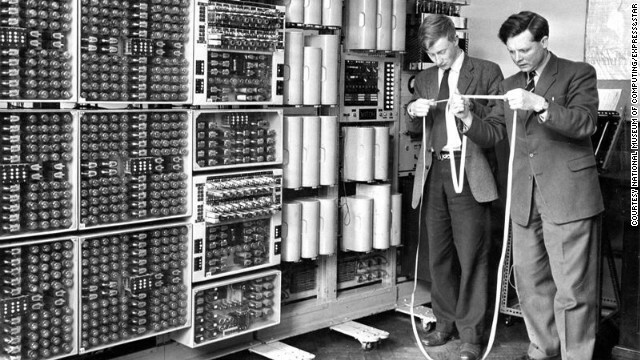 computer used paper tape for input, and the photo shows two men – supposedly scientists, staring at the paper tape which has all of the information stored as holes punched into the paper. Having used punched paper tape, I can tell you there’s nothing to be gained by a human looking at it. However, I do recall that while I was in college an enterprising individual decided that the chads (remember chad from Florida?) – the little dots of paper punched out of the holes – would make great confetti. The teletype machines had a little plastic box into which all of the chads dropped, so he saved a bagful and took it to the next football game. Unlike plain paper the paper tape and its chads had some type of waxy coating, which meant that when it was tossed and ended up in people’s hair it would stick. It took heavy duty shampoo, the 1970’s equivalent of a pressure washer and half a day to wash the chads out. Wonder if someone at the museum will be tempted to try the chad confetti and have the same experience. This entry was posted in Business, Communications, Culture, Education, Future, History, Humor, Media, People, Sports, Technology, Uncategorized and tagged Business, Chad, CNN, computer, Confetti, Florida, Material, museum, Paper, Punched tape, relays, restoration, tubes, valves. Bookmark the permalink.